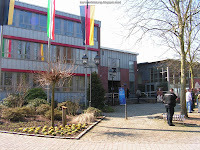 On Saturday 21 March Mini Art Con 2009 was held in the town of Reken, Germany. For me drive took about two and half hours but it was pleasant because of the sunny weather. The location was easy to find and there was plenty of parking space nearby. The building itself was similar to last year's edition: a large hall with a stage. Once inside I was immediately plunged into the familiar and friendly atmosphere of the event. Not too small to be boring, not too big to be a mega-event. 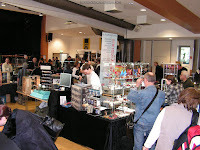 A good mix of exhibitors and traders offered a lot of interesting stuff to see. I immediately sought out my countryman Guy Botteldoorn who was displaying some of his miniatures on a table which he shared with Stefanie Arndt. A lot of my other painting friends were there too, and like most events I spent a lot of time chatting with Michael Holzapfel. And after seeing her on last years event and also at Crisis 2008, I finally took the time to have a chat with Brenda Gosman, who also had her own display stand. For me, the highlight among all the exhibitors was Ben Komets. I'm a real fan of his work and I was very delighted to see the Poland Slayer Sword winning piece in his display cabinet, as well as the German Slayer Sword entry. The painting competition had less entries than last year, but the level was again very high. The best of show award went to Brenda Gosman for her Cordelia, after winning several other prizes for the rest of her entries. I also managed to finish a piece in time: an Infinity figure. I didn't really have the time to put a lot of effort into the figure, so it didn't win anything, as expected. But I really wanted to enter something because competing is more important than winning, isn't it? :) If I find the time to take pictures of this figure I will surely post it here. With this post I'm also happy to announce I finally have a gallery set up! It is hosted at Michael Holzapfel's darklined.com website. It's still empty apart from the Mini Art Con 2009 pictures, but I hope this will change in the near future. 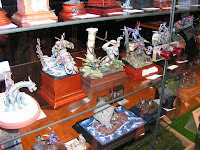 Expect my painted miniatures to get a place there, as well as more pictures from past events. When chatting about miniatures on events like last week's Mini Art Con, a subject that keeps returning is the demise of one of the greatest miniature manufacturers of the past 10 years: Rackham. When I started out with miniature painting, their figures had rapidly become my favorite. I followed their new releases every month, on the lookout of nice figures to suit my painting needs, often for competition entries. I also played their game Confrontation for a short while. But then news appeared about financial troubles at Rackham. The production of new figures came to a halt and after a long silence they re-emerged with a new game called AT-43, which featured pre-painted plastics. But they promised to keep producing the existing metal miniatures range under the name of Rackham Legends and even introduce some new ones. I think they produced 2 or 3 new ones, all of them extremely limited edition and quite expensive. On top of that they even replaced their existing Confrontation game with a pre-painted equivalent. In the last months, promotions on our webstore have given you the opportunity to purchase miniatures from our metal range at attractive prices. Our stock of these miniatures has dwindled, but it’s still taking up a lot of space in our new offices. Thus we have decided to dispose of it. We will not commercialize these metal miniatures any more in the future. The existing stock will not be destroyed; it should be sold to another company, which you will be able to buy the remaining miniatures from at a cost that’s bound to be very attractive. Do you know if this new company are going to have new metal minis commissioned, or jut sell the existing range/parts? Expect the existing stock to be sold and nothing beyond that. I think this says enough: "and nothing beyond that". I still can't believe how this company turned their arse to the fans. I understand the company has had some hard times: financially, designers and sculptors leaving, but on the other hand why do they decide to completely discontinue something like the Confrontation line of miniatures. And then I'm not even talking about their other projects they failed to get off the ground: Hybrid, Cadwallon, the Cry Havoc magazine. Mini Art Con 2009 is history! Last Saturday I took the 250 km trip to the small town of Reken in Germany to attend this event, and it was great! Like other years the overall quality was very good and the atmosphere was very friendly. I took about 150+ pictures and I have already made a selection to put online. My good friend Michael Holzapfel was so kind to donate some of his web space and set up a gallery for me. It still needs a lot of work, but at least I have a place now to store my pictures. Expect a more detailed review and the picture gallery later this week. When the gallery is online and running I should really put some time into uploading all the pictures of my painted minis, and also to put the promised pictures of Crisis 2008 online.